As a physician, be it a family practitioner, an oncologist, an orthopedic surgeon, or an ER doctor, your life is busy. You probably work long hours, serving your patients and training staff. In addition to your family and outside hobbies, you might not have much free time. And in this precious free time, you probably don’t want to be reading reports on the health of your medical practice. “Isn’t that the practice manager’s job?”, you think. Comprehensive Healthcare Revenue Management, a top medical billing company, begs to differ. Since the buck stops with you, you need to read your productivity reports (either provided by your in-house medical biller or your outsourced medical biller) in order to understand the financial health of your business. Below, we list the reasons to read and analyze your productivity reports, and if you need a medical biller, contact us today! Determine the future of your practice. There are dozens of reports you can generate, and over the course of time, you’ll see which ones best suit your needs. That being said, the reports can show which patients are the most profitable for your practice’s cost structure and efficiencies. This can help you determine how to navigate the business and where to build the practice. Assess your own productivity. These reports will show you your own productivity, which you can use to compare to that of your colleagues. Feedback is good since it’s hard to evaluate your own performance objectively. It could be a matter of not delegating enough or prioritizing tasks. Assess your coding pattern. Knowing your coding pattern can help tell you your level of service for your patients. Knowing how your codes line up with other physicians in your field can give you a sense of if you’re heading in the right direction with your practice or if you may be becoming more of a specialist. If there is more than one physician in your office, individual reports can ensure physicians are seeing a variety of patients and not being overloaded with certain cases. Consider comparing your codes to the national average in terms of Medicare and Medicaid claims, which can help you see medical coding accuracy and coding errors. Audit periodically. An internal audit is always a good idea to ensure standardization across practitioners for the same services rendered as well as to catch medical billing errors that may be happening repeatedly. Check for compliance on what was billed and what was documented in the medical record, and offer guidance and/or training to prevent future errors. Medical billing and coding is constantly changing, so it’s a good idea to stay abreast of the changes in order to stay compliant. Having an experienced, independent auditor look at your medical coding and billing practices along with the physician’s records can offer a fresh perspective. Collection reports and patient payments. Having a good idea of the time-frame of your revenue cycle is key in order to budget for the overhead costs as well as for the big-ticket items of medical equipment purchases or for building a new facility. The revenue cycle turn around will help you know the average time frame and the time of the month certain insurance companies reimburse providers. Number of claims report. 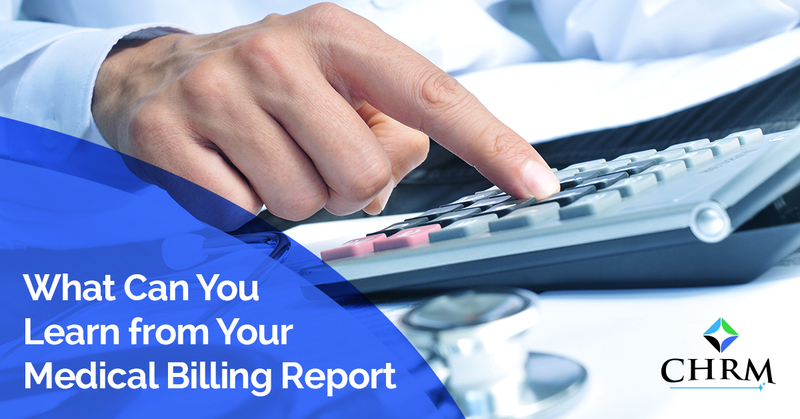 This can help tell you if your medical practice is growing or not, and it can help show you errors in medical billing that are occurring. Plus, this can do wonders for your mental state of mind when you realize just how many people you actually touch. As medical practitioners, we are always looking to maximize efficiencies in order to better serve our patients and our staff. Reports are just one tool medical practitioners can utilize to be better at their jobs. Overall, what really matters is the quality of care you give, and the satisfaction of your patients. This can be measured by surveys, customer reviews, and the old-fashioned “thank you” offered at the end of each office visit. Comprehensive Healthcare Revenue Management is ultimately in the people business. Sure, we offer medical billing services, but we serve our clients and help them in their mission to heal the sick and help their communities by providing amazing healthcare. We have departments that specialize in oncology medical billing, orthopedic medical billing, hospital billing, medical billing for free-standing emergency services, and physician billing. We offer monthly reporting that is available to you by the fifth business day of each month following the close of the previous month, or three business days after your company staff has closed the month. We do quarterly analysis of billing, collection, and cash flow processes for your business. And, as a transparent and honest medical billing company, your data is always available to you, so you can manage your business and keep it financially sound. As a Top Rated Local®medical billing company, CHRM is your all-inclusive medical billing service. Contact us today!